In front of the Willowbrook Mall on 1960 and Hwy 249. 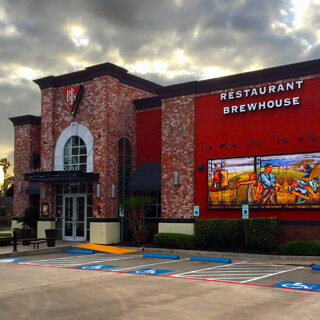 At BJ's Restaurant & Brewhouse we're proud to be serving the great people of Houston, TX. With plentiful entrées to choose from, whether it's our delicious deep dish pizza, our handcrafted burgers or our USDA choice steak, you are sure to find something to crave from our extensive menu. Speaking of craving, have you tried our Sweet Pig® or Chicken Bacon Ranch pizza? If not, you're in for a real treat! If it's not pizza you're after check out our succulent USDA Steak options, or take a bite out of one of our juicy burgers. If you're on the hunt for something light, check out our EnLIGHTened Entrées, they're light on the calories with full-on flavor. At BJ's we take pride in our brewing process and have a large selection of always on tap craft beer for you to choose from. Try our Tatonka® Stout, a classic style that's rich and flavorful. Or, if you're looking for something light to pair with a selection from our EnLIGHTened menu, such as the Hawaiian Mahi-Mahi, check out our LightSwitch® Lager, at only 103 calories per 12-oz serving you can have your cake, so to speak, and eat it to. Speaking of cake, check out our decadent desert menu from our famous Pizookie® to our new Peach and Candied Pecan Cobbler, you won't be disappointed! Our restaurant is well known to the late night party crowd when they are done at the local clubs.